Going to try to make this for dinner tonight. I highly doubt my boys will eat it, but you never know. I know the KoD will enjoy it, and I hope I will too. 1. In a medium sized heavy pot, heat the olive oil over medium heat. Add the onion, bell pepper, celery and garlic. Cook the vegetables until soft, stirring occasionally (about 10 minutes). 2. Add the beans, stock, herbs and spices and simmer for 30 minutes. Add salt and pepper sauce and adjust seasonings. With a potato masher, smash the beans so you have a thicker mixture with some whole beans remaining. 3. Serve over plain white rice topped with sausage. ETA – the boys totally loved it!! that sounds absolutely delish! 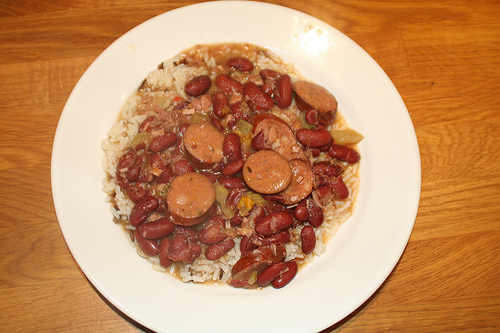 i always consider it such a win if my kids eat beans– so healthy, so easy, so inexpensive. a girl can dream, right?! thanks for the recipe! let us know how it comes out & i may actually try it sometime…thanks for the recipe & hope the boychikles like it! My wife makes this all the time and the kids love it. Tell me, Mark, when you give to children for school, do you mix it all up or do you keep rice and beans separated?